This treasure will make you feel like you're traveling through time in some of the world's most exotic locales! The SAHARA DRIFT COAT is crafted in the ancient city of Fez with the same exquisite workmanship of all our famous Moroccan garments with many of our unique design features. The extravagant drop-shoulder triangular yoke -- in front AND back -- is covered with miles of quilted topstitching, as are the diagonal pocket tabs. 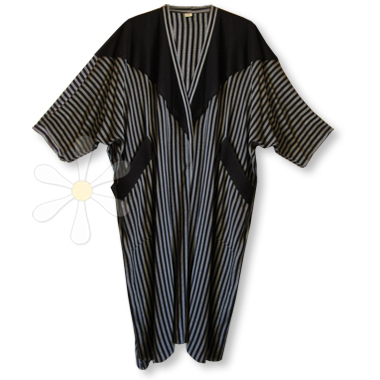 And as this one is in our Special Stash Collection, body of the garment is in our exclusive woven stripes and the yoke is in our signature susti -- a treasure indeed!